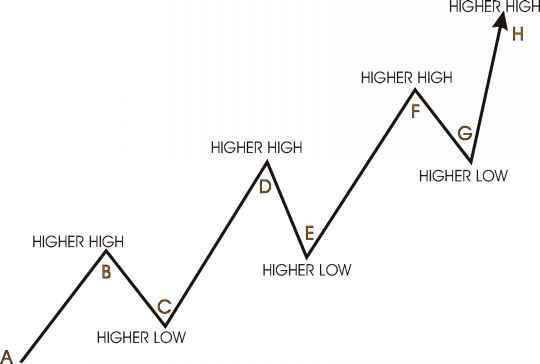 An uptrend is defined by higher highs and higher lows. 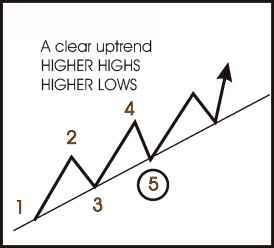 A third test at point 5 is needed to confirm the trend. 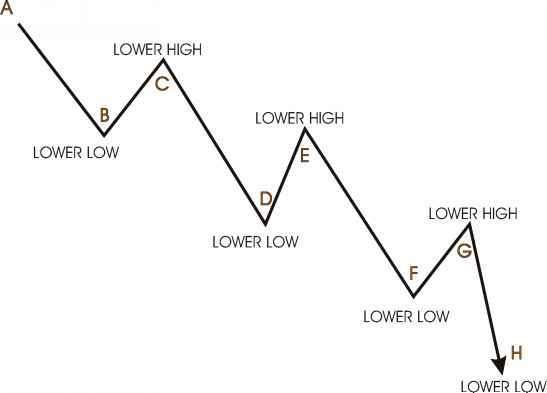 A downtrend is defined by lower lows and lower highs. 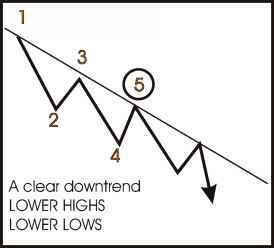 A third test at point 5 is needed to confirm the trend. Note that point B does not break to a new low. The stock bounces from point B, breaking above the downward trend line. It is important that this move from point B to point C is done with an increase in volume to confirm an upside breakout and a double bottom. 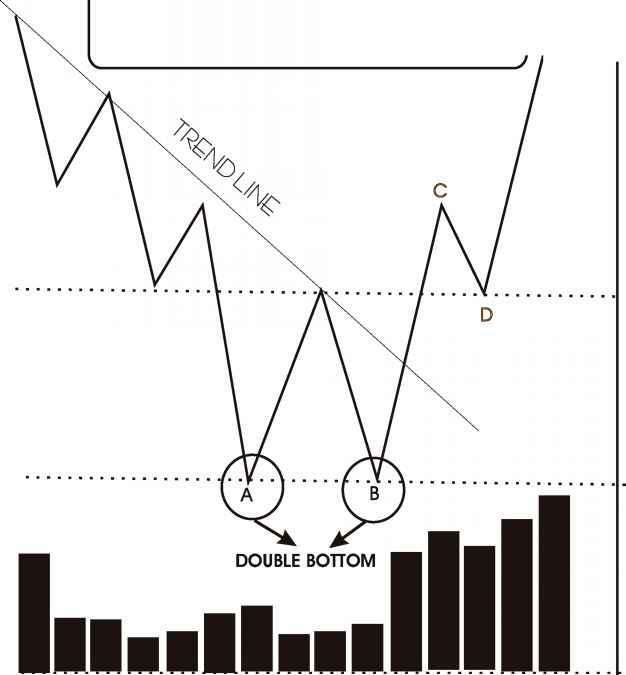 Double bottoms will commonly have a pullback to point D.
The hangingman pattern is only found at the top of a bullish advance. When this same candle is found at the bottom of a decline (See Fig 4.4b), it has a different implication. The hangingman candle is a bearish pattern because the bulls were unable to close the candle above the opening price, suggesting that the stock is running out of steam and the momentum may reverse. These bullish hammer candles show that the decline is losing momentum. 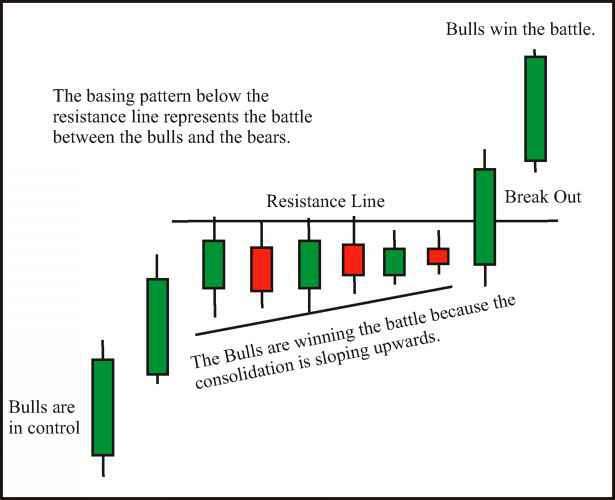 Note how the bulls rush in to buy the stock near the lower ranges of the day. Even though the bulls may not be able to close above the opening price (Fig 4.4b), a change in power from the bears to the bulls is identifiable. 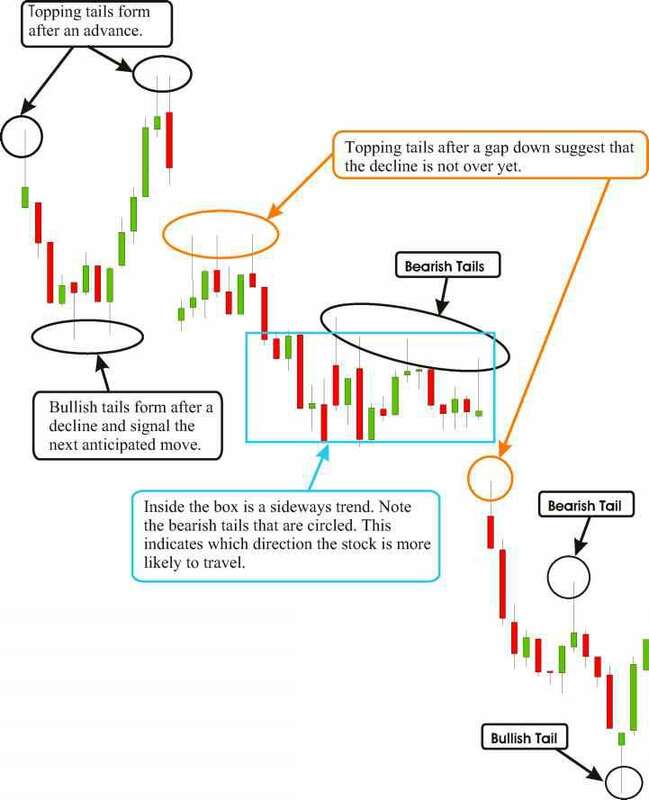 The inverted hammer pattern says that when the stock was trading near the high of the day, there were still bears lingering around and they were able to pull the stock away from its highs. But notice how the bears seem to be drying up, as they were unable to close the candle below the opening price. This says the bears have completed their turn and you should watch closely for the bulls to step in. The bullish engulfing pattern is made from two candles. The engulfing green candle opens below the low of the previous day and closes above the high of the previous day. This shows that the bulls are taking control and the traders who went short the day before are now holding a losing position. Look for them to cover their shorts and drive the price of the stock even higher. The bearish engulfing pattern is made from two candles. The engulfing red candle opens above the high of the previous day and closes below the low of the previous day. This shows that the bears are taking control and the traders who went long the day before are now holding a losing position. 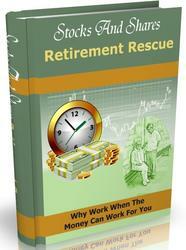 Look for them to sell their long positions and drive the price of the stock even lower. The bullish harami and the bullish harami cross are patterns that show the end of a move confirmed by a small intraday move which stays within the previous day's highs and lows. 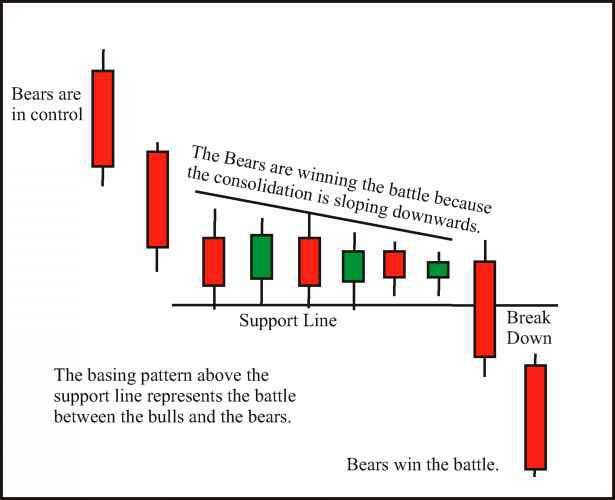 This tight trading says that the bears are finished and the bulls are starting to come in from the sidelines. Look for higher prices once the high of this pattern is taken out. The bearish harami and the bearish harami cross are patterns that show the end of a move confirmed by a small intraday move which stays within the previous day's highs and lows. 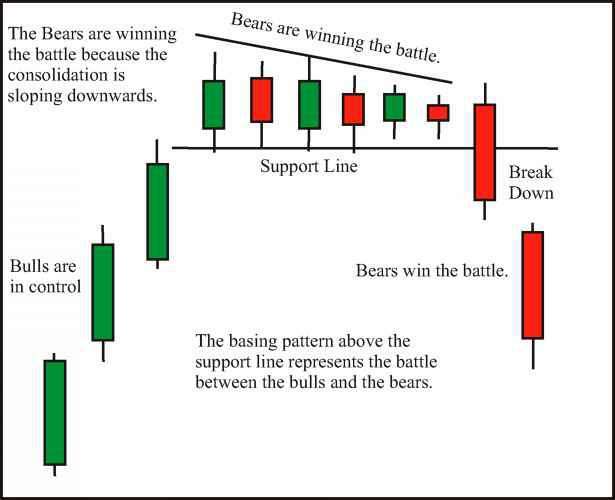 This tight trading says that the bulls are finished and the bears are starting to come in from the sidelines. Look for lower prices once the low of this pattern is taken out. The dark cloud cover is a very powerful bearish signal. 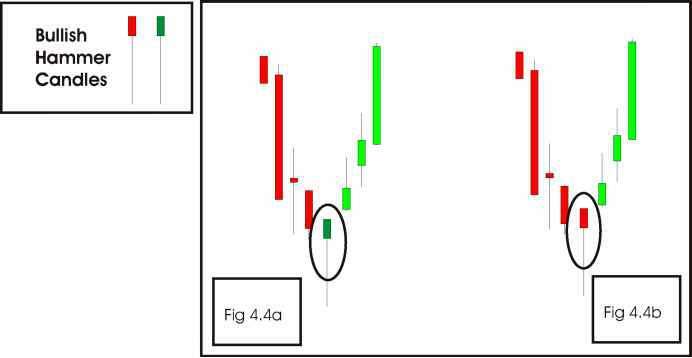 A true dark cloud cover pattern has the red candle closing below ( z ) the halfway point of the green candle (point Z). This is the most powerful bearish pattern. In this pattern, the stock gaps up above the previous day's high only to sell off immediately, showing that the bulls were greedy and this caused the gap higher that morning. The bears take advantage of the bulls' greed and short sell into these extremely high prices. The bearish shooting star and the bearish doji shooting star patterns show the end of upward momentum, because they gapped higher at the open without the ability to move a great deal higher. Gaps are supposed to be the most powerful bullish moves. Therefore, they should have the shorts scared and covering, driving the prices even higher. But this is not the case. 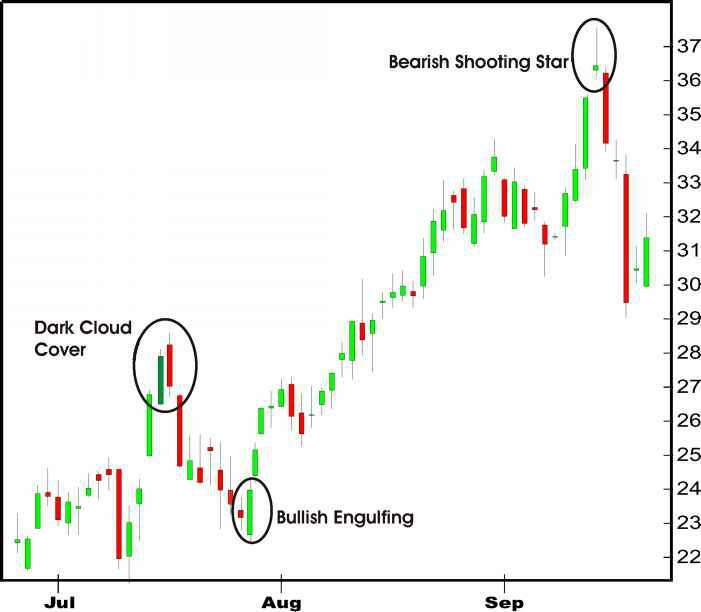 After the stock gaps higher, the shooting star pattern has a bearish tail, which says the bears have arrived. As for the shooting doji, this says that the bears that are already short did not panic and start to cover. They are happy to remain short and the bulls are not able to drive prices higher. On the following day, there can be a large move downward. 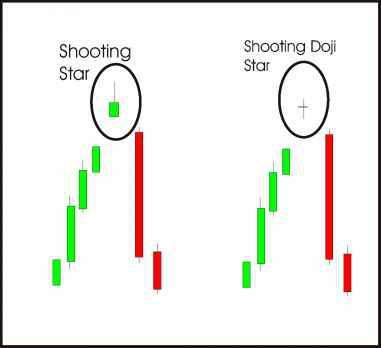 The shooting star and shooting doji star are powerful patterns that every trader should know. The bullish lost star and the bullish doji lost star patterns show the end of downward momentum, because they gapped lower at the open without the ability to move a great deal lower. Gaps are supposed to be the most powerful moves. Therefore, they should have the longs scared and selling, driving the prices even lower. But this is not the case. After the stock gaps lower, the lost star pattern has a bullish tail, which says the bulls have arrived. As for the lost doji, this says that the bulls that are already long did not panic and start to sell. They are happy to remain long and the bears are not able to drive prices lower. On the following day, there can be a large move upward. 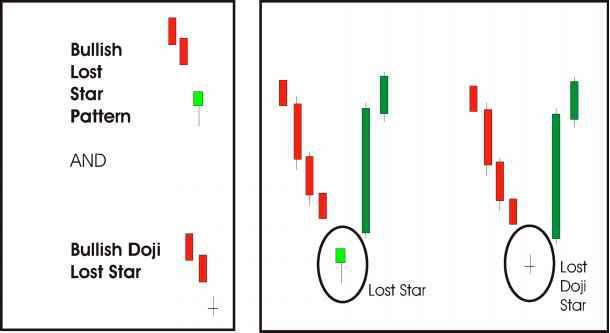 The lost star and lost doji star are powerful patterns that every trader should know. Note that even though this is a bullish trending stock, the bearish chart patterns still work. 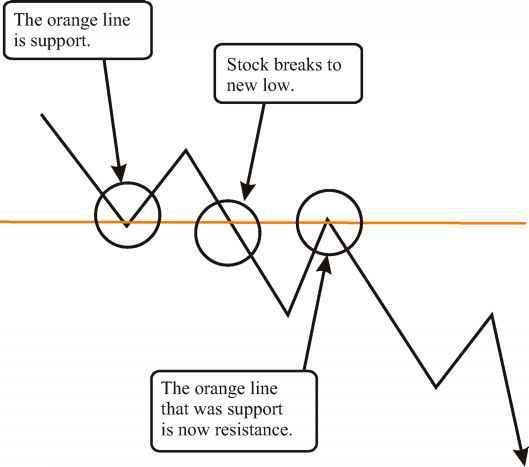 Once a stock reaches a point of resistance, scared longs will sell, causing the stock to pull back. The less the stock pulls back , the more it suggests the longs are not scared and therefore they are not selling. 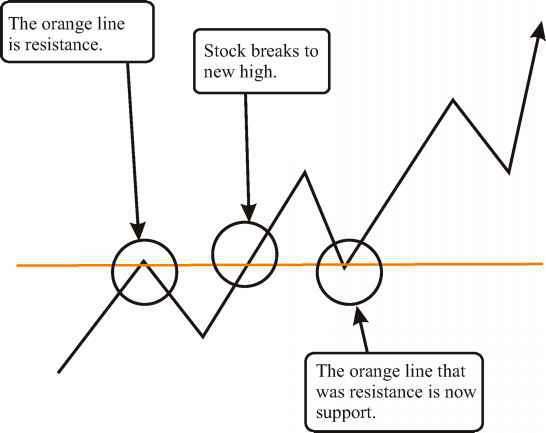 This causes the stock to base below the point of resistance. When traders see this basing pattern, they become bullish and start to buy the stock. Because there is lack of supply, the stock breaks through resistance and continues higher. Once a stock reaches a point of support, scared shorts will cover (buy), causing the stock to move higher. The less the stock moves higher, the more it suggests the shorts are not scared and therefore they are not covering. This causes the stock to base above the point of support. When traders see this basing pattern, they become bearish and start to short the stock. Because there is lack of demand, the stock breaks down through support and continues lower. After a stock makes a significant advance, it is always healthy for the stock to consolidate sideways before continuing its advance. After this consolidation, you can clearly see where the stock has support. This support line must not be broken downwards. If the line of support is violated, the healthiness of the stock is in question and you would sell your long position and consider going short.